A detailed plan for a long-awaited contra-flow bus and cycle lane beside the Bleeding Horse public house on Camden Street is being drawn up. Dublin City Council officials told a recent local area meeting that they would be brings the plans to city councillors within the next month. After years of promises to install the southbound contra-flow lane, the city is now pushing ahead with the project because extra buses are to be diverted onto the route due to the Luas Cross City works. That’s the bad news for people cycling on the street — because of the works to construct the Luas tram extension to from Stephen’s Green to Cabra, around 40 extra buses per hour at rush hour are to be diverted on the route from Camden Street to Dame Street. However, the contra-flow lane should allow people cycling to avoid a current detour around a block of building on a cycling-unfriendly system of one-way system of streets. Closer to the core city centre on the same route, the council is also planning to block off access onto Aungier Street / Redmond’s Hill from Bishop Street, a street at the side of DIT Aungier Street (pictured, right). The changes will stop commuter traffic exiting Bishop Street and blocking the cycle lane and traffic lane on Aungier Street. 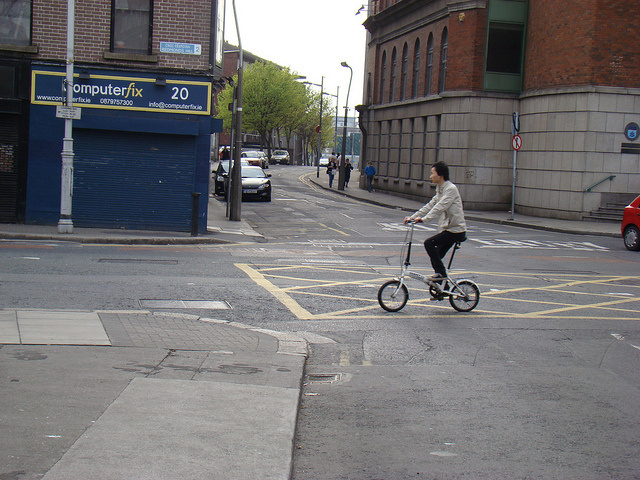 Traffic engineers residentstold councillors that most of the traffic using Bishop Street was using it as a “rat run” from Kevin Street Upper — mainly to get around a banned turn on Kevin Street Lower to Camden Street. The plan outside DIT is also linked with the Luas works and aims to keep buses moving on the route. Local access is to be maintained. At the area meeting, Cllr Mannix Flynn (independent) strongly outlined his fears that the rat running would continue and that it would just be pushed further up the road. Cllr Paddy McCartan (Fine Gael) said he welcomes the closures of all rat runs. Cllr Chris Andrews (Sinn Fein) and other councillors questioned the impact on the residents of Bishop Street — city officials replied that access would be maintained to residents but a loop around the block would be required by residents exiting the street. Cllr Kieran Binchy (Fine Gael) questioned the plan to use bollards to block of junction, however the engineers said that this would only be a temporary arrangement until the final layout and finishing are agreed on. Cllr Claire Byrne (Green Party) said that, as a cyclist, she welcomed the changes, but she was worried about the extra 40 buses an hour on a street already busy with buses. Cllr. Claire Byrne’s concerns about yet more buses present on some streets highlights a real road safety concern for cyclists. Many of us who are trained ‘Bikeability’ instructors call this the “wall-of-steel effect”, which when coupled with thousands of taxis present, makes the bus lane system far too intimidating for cyclists. Any move to institute counter-flow bicycle passage on multi-lane one-way streets/gyrotaries is to be welcomed in principle but why have we to wait so long for this particular one to be completed. It was in gestation when the Cycling Officer was in post and he is long gone! The 10% modal-shift nationally to cycling by 2020 recedes further at this rate of ‘progress’. Added to this those 40 extra Buses will be turning down Dame Street into Westmoreland Street where it is already blocked up by Buses coming from Inchicore Rathmines and from Suffolk Street Directiion. It is absolutely Lethal along Dame Street and Westmoreland Street at the moment with Buses and all those Taxi’s. They seem to be only putting that Contre flow Bike Lane in on Camden Street because they decided to put in a Bus Contre Flow beside it and not out of the goodness of their Heart. All grudgingly done and last minute. Like a lot of the bad Bicycle Infrastructure,put in at the last minute after a Road or Bridge is designed. I am mindful of what Mick McKillen and John Power have written on the subject and can’t help but feel they express the feelings of those who actually cycle the route and not just tinker with cycling issues in piece meal fashion. It would be nice if commuting cyclists had some input in these “solutions” before they go from inception to reality. A serious amount of Public gets blown ineptly in the name of cycle improvements annually by County Councils with little real benefit for the aforementioned commuting cyclists. Those using the route regularly will no doubt be familiar with the associated problem caused by cars making the right turn from Bride Street onto Bishop street (for their rat run) “encouraging” other drivers to quickly and unthinkingly undertake by (illegally) entering the mandatory cycle lane. This is very dangerous and could be easily and cheaply prevented by placing some form barrier around the cycle lane at an appropriate point. As residents etc will still wish to access Bishop’s Street from Bride Street this will still occur albeit likely less often. Also when closing off these rat runs will the city adopt the idea of filtered permeability and allow cyclists to use these newly quietened streets? The contrta-flow was necessitated now by the fact that luas works impede the access of buses normally using Kildare St. One of the causes of the rat-runs along Bishop St is the appallingly bad sequencing of traffic-lightson Kevin St and beyond, from the Dean St/Patrick St Junction, right through to Cuffe St/Stephen’s Green, resulting in the road looking more like a car-park, right back as far as Cork St most days. Paul.